Groundnut (peanut) is one of the most nourishing foods available in the world. It differs from other nuts in that it is formed in the ground and has to be harvested like other root crops. It is relatively inexpensive and has a high content of proteins, fats, carbohydrates and calories. It is also a good source of B complex vitamins like thiamine and niacin and minerals such as phosphorus. The groundnut protein is of high biological value and is easily digestible. 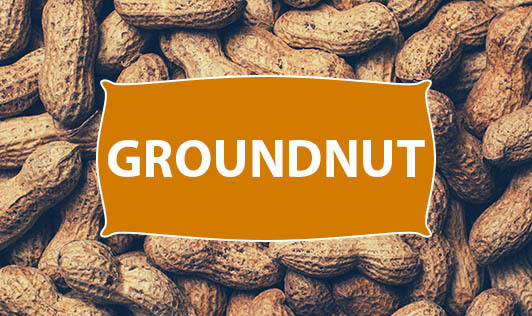 Groundnut can be consumed in many ways and may be eaten boiled, steamed or roasted. When mixed with jaggery, it makes a delicious sweet known as chikki. Groundnut oil is extensively used in cooking and as a salad oil. Groundnut flour, peanut butter, groundnut milk are other forms in which we consume this nut. It is also used as a vegetable when the seeds are tender. It can be taken in the germinated form, wherein their nutritive value increases. Eating fresh roasted groundnuts with jaggery is a nutritious food for all ages especially growing children. Groundnuts should be stored in cool, dry conditions because they are prone to contamination with moulds. As a word of caution, never eat nuts with any trace of mould on the shell or kernel. Excessive intake of groundnuts may cause high acidity and indigestion and it is also one of the most common food allergens.